A transcription of handwritten notes composed during pauses and slowings on three separate walks and one drive in 2014, February March April April is a series of observations received in the scale of presence. These four collections—February 2, 2014 / March 7–8, 2014 / April 9, 2014 / April 11, 2014—are a sample from over 100 such works written by Meier since 2012. 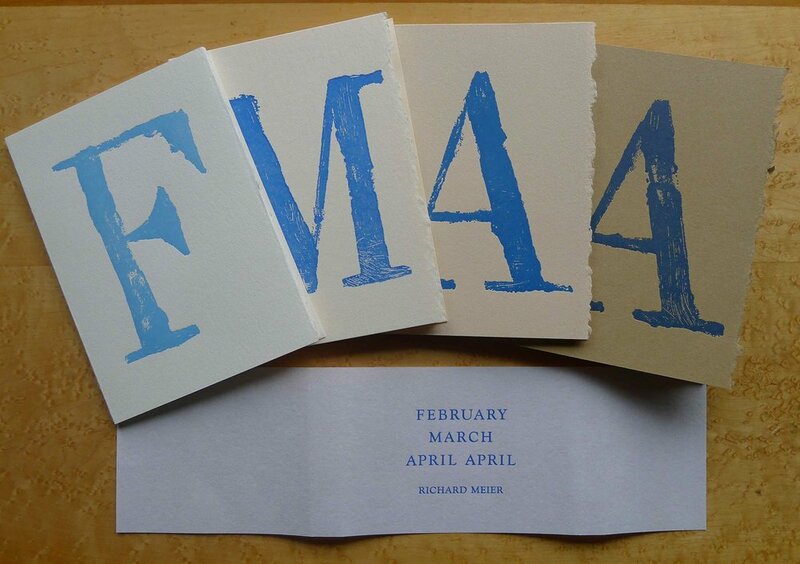 Covers designed by the wonderful Max Greenstreet and letterpress printed on Stonehenge paper. Bands letterpress printed with metal type on masa paper. Richard Meier lives in Madison, WI and at the Beach Aire Motel in Kenosha, WI, where he is writer-in-residence at Carthage College. He is the author of three previous collections, most recently In the Pure Block of the Whole Imaginary (Omnidawn, 2012).